BAGUIO OIL DIALOGUE: In light of allegations regarding oil price discrepancies in Baguio City, the Department of Energy (DOE) initiated a dialogue with Mayor Mauricio G. Domogan (left) to discuss issues affecting oil pricing. Leading the dialogue are (L-R) Luzon Field Office Acting Director Rey Liganor and Oil Industry Management Bureau Director Rino Abad, together with Retail Market Monitoring and Special Concerns Division Chief Renante Sevilla. 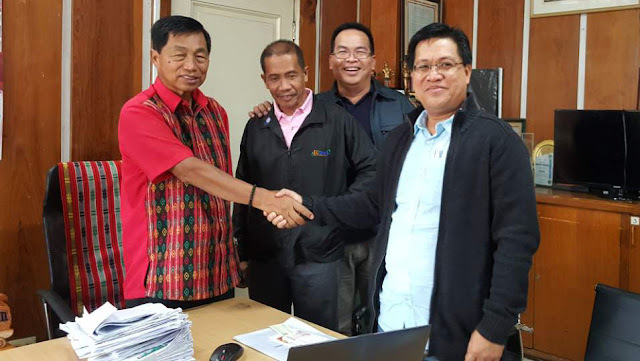 BAGUIO CITY – The Department of Energy (DOE) today initiated a dialogue with the local government unit (LGU) of Baguio to give its citizens a detailed understanding about the city’s oil price situation. The dialogue was spearheaded by Oil Industry Management Bureau Director Rino E. Abad and Luzon Field Office Acting Director Rey Liganor, with Baguio City Mayor Mauricio G. Domogan in attendance. “Dialogue and monitoring mechanisms are among our means to ensure that transparency in the deregulated oil industry is properly observed and practiced,” the Secretary added. During the meeting, the DOE discussed the oil price triggers; the oil supply and demand situation in Baguio vis-à-vis other provinces in North Luzon; the market situation in the area; and oil pricing analysis. The DOE will hold another round of consultations on Thursday (14 June) with the LGU of Baguio City and local oil industry players, such as the oil retailers and dealers. Mayor Domogan, Vice Mayor Edison Bilog and the City Council have all signified their participation. As encapsulated in the E-Power Mo campaign of the DOE, this initiative is aimed at providing the LGU and its stakeholders a better and transparent understanding of the oil industry operations within the area. The power agency also aims to come up with a resolution on the price discrepancies under the framework of existing laws and regulations. For consumer concerns, please contact the DOE-Consumer Welfare and Promotion Office at (632) 479-2900 loc. 329 or email: info@doe.gov.ph. The public may also reach the DOE through its Official Facebook page, fb//doe.gov.ph, and its Twitter account, @doe_ph.